Subsidy was the title of an exhibition by JOSHUA SCHWEBEL which just closed this weekend at Künstlerhaus Bethanien in Berlin. Subsidy, as its title implies, revolved around the value of artistic labour and according to the artist ‘how art performs its own hypocrisy’. 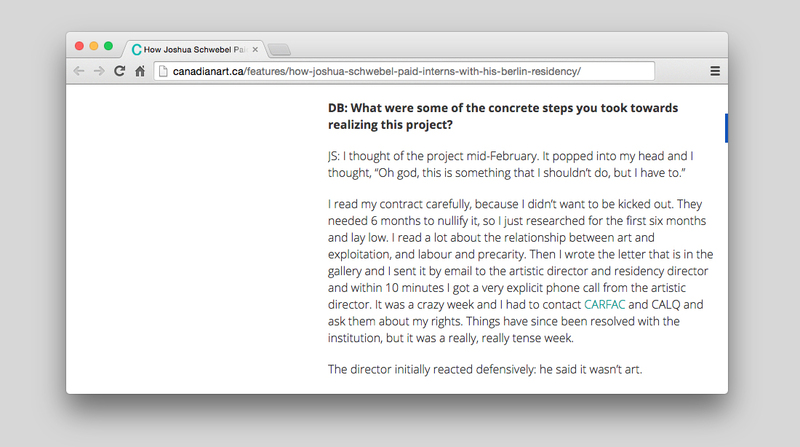 Feeling uncomfortable with the idea to work with unpaid interns during his residency in the Berliner Institution, JOSHUA SCHWEBEL used the whole of his grant budget to pay interns working for him during his stay there. Unfortunately the exhibition which featured an office space containing a desk, mail slots, and an intern, is now finished but I really invite you to read the whole conversation SCHWEBEL had with DAVID BALZER where he explained his process, his doubts and the result of this year’s experimentation: http://canadianart.ca/features/how-joshua-schwebel-paid-interns-with-his-berlin-residency/.